I joined Molly and John to discuss the historical significance of the West Virginia teachers strike, Bari Weiss continues the New York Times tradition of attacking student activists, and Trump may have engaged in some light witness tampering. On this week’s episode of the Danthropology Podcast, I talk to author, journalist, and co-host of the Belabored Podcast, Sarah Jaffe. 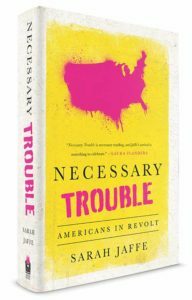 Sarah’s new book, Necessary Trouble: Americans in Revolt, which I reviewed here, was published before the election but seems even more relevant today than it did just before. I joined Molly and John to discuss Jet Blue flight attendants’ effort to unionize, and the importance of the Poor People’s Campaign. Also, thoughts on the Golden Globes, and some Baltimore public schools remain without heat.